Attached please find a copy of a letter from the Burlington Walk-Bike Council regarding our support for the Pine Street Coalition's call for additional redesign of the Champlain Parkway. This same letter was also mailed to you via USPS on May 3, 2016. Please strongly consider supporting additional rethinking and redesign of the Champlain Parkway, despite the perceived reluctance of the City's partners at the state and federal level to support major changes. We think that the proposed changes to the design will both improve the project and also make it less expensive. And I'm sure we all would like to ensure that this major public investment is designed for the long-term benefit of our entire community, including safety for all transportation modes. Thank you for your attention to this important topic, and for your commitment to creating a more walkable and bikable Burlington! economic vitality of Burlington’s South End." Coalition to re-vision and redesign the Champlain Parkway project, as described in that organization’s “Champlain Parkway and Pine Street Corridor Re-design Guidelines” dated March 21, 2016. The Pine Street Coalition Guidelines incorporate many of the BWBC recommendations submitted to the City in oucomments from 2014. These recommendations include safe, separate walking and biking facilities throughout the corridor, roundabouts at key intersections, and maintaining connectivity between the southern end of Pine Street and Queen City Park Road. We recognize that re-visioning and redesign requires additional time and may be resisted by the City’s partners at the state and federal levels. However, we also believe that the redesign proposed by the Pine Street Coalition is both less expensive and easier to implement than the current plan. If this is communicated effectively to the City’s partners, the resistance may be less than expected. 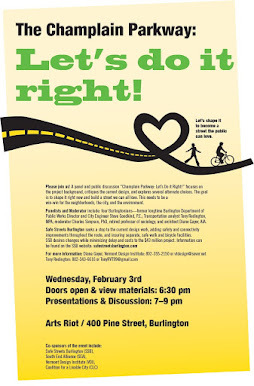 The Burlington Walk Bike Council urges you and your administration to do all you can to ensure that this major investment meets our City’s vision for a walkable, bikeable, sustainable community.